A dozy driver mishandled a turn early Tuesday and plowed into a backyard pool in Santa Clara, according to fire officials. Bob Redell reports. 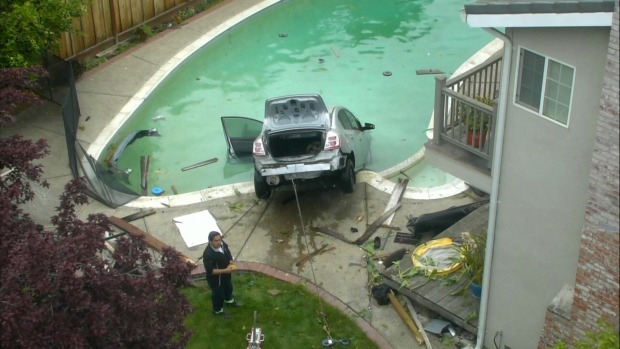 A dozy driver mishandled a turn early Tuesday and plowed into a backyard pool in Santa Clara, according to fire officials. The bizarre crash happened around 3 a.m. near Warburton Avenue and Calabazas Boulevard when the 19-year-old driver said he lost control of his sedan, smashed through metal and wooden fences and then plunged into the deep end of the backyard pool, Santa Clara fire officials said. The teenage driver, who was administered a field sobriety test and passed, was not injured in the crash, but the car was completely submerged. The panicked driver tried to save his waterlogged belongings, but his efforts were unsuccessful, according to witness Alex Costal-Levy. "He seemed pretty worried, understandably, because his car was in a pool," Costal-Levy said. In order to fish the car from the pool, a towing crew attached cables to the rear end of the car and slowly managed to pull it out of the water. Sections of two fences were destroyed and some patio furniture was tossed into the water, but it appears the pool did not suffer major damage. "That was one lucky pool," Costal-Levy said. "(The crash) could have caused more damage." The homeowner was not inside of the house at the time of the crash, and it is unclear if they are even aware of what transpired in the backyard.